Uttarakhand state is now gearing up to tackle the issue of solid waste through its Urban Local Bodies, i.e. the Municipalities. The increasing migration from villages and the growth of urban populations has resulted in a corresponding growth of solid wastes in cities and towns across the state. The Urban Local bodies-Municipalities are finding it difficult to locate dumpsites due to a scarcity of land within the municipal boundaries and even outside. Presently unplanned dumpsites can be seen in government unused land and sometimes in areas coming under the forest boundary. For the others it the nearby nallas, streams and rivers which is convenient dumping area. In Dehradun it the Bindal and Rispana rivers which have become like an open drain for one and all to dispose their wastes without any fear of the state or society. It is also in these river catchment areas that the real slums have come up, mushroomed and has patronage of vested interest. Proper management of solid waste is critical to the health and well-being of urban residents. In many cities and towns several tons of garbage is left uncollected on the streets each day. This is a breeding and feeding ground for microbes and pests that spread diseases, clog drains and creating a myriad of related health and environmental problems. 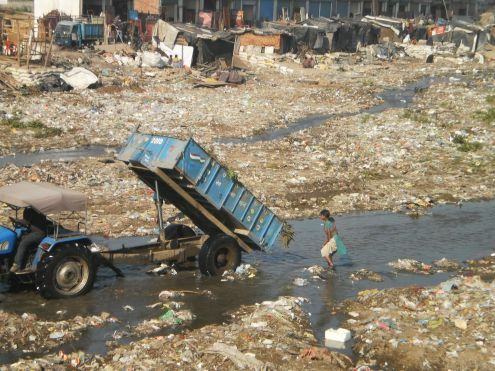 The urban poor who in a large numbers reside in slums with little or no access to solid waste collection and often in areas that are contiguous with open drainage are particularly vulnerable to various diseases and face health risks. While urban residents in developing countries produce less solid waste per-capita than in high-income countries, the capacity of their cities to collect, process, dispose of, or re-use solid waste in a cost-efficient, safe manner is far more limited. The challenges in collecting solid waste will dramatically increase in the coming years as a result of both the rapid growth of cities and towns and increases in per capita waste production. The strategies that can be adopted for integrated solid waste management are, viz. to reduce the amount of solid waste generated, to recycle as much, refuse as possible, to compost the waste with appropriate environmental controls and with energy recovery options and to continue sanitary land filling for selected waste items. Solid Waste Management is one of the important concerns of not only municipalities but also of the state at large. This essential service is not efficiently and properly performed by the local bodies due to lack of financial resources, institutional weakness and disposal options, besides public’s apathy towards environmental cleanliness and sanitation. The Solid Waste Management must minimize the pollution of the environment as well as utilizing the waste as a resource. It should also be achieved in a way that is financially sustainable, i.e. using methods that can be afforded by the community over a long term. Solid waste management needs to look beyond the matter of collection and disposal of garbage. The wider question of waste generation and its disposal is a universal issue of development versus environment, which should be the concern of the state and not of municipalities.